Among the many misconceptions that people have about India and the city of Mumbai in particular, Dharavi is easily the most significant one. Children study it in general knowledge books as the largest slum in Asia, but that moniker goes a long way in shaping our perceptions of the place. ‘Slum’ actually isn’t the definitive word there. The activity that goes on there is probably more than what a lot of Mumbai can boast of. The Shadow Land in the Maximum City will actually disappoint all those who venture in expecting abject poverty and rampaging crime, a la Slumdog Millionaire. 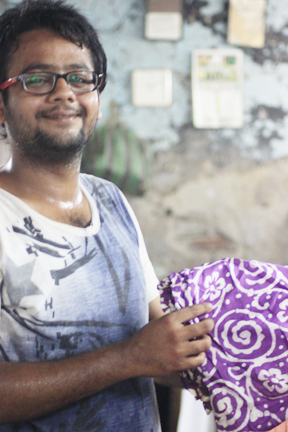 For starters, Dharavi happens to be the go-to place for cheap housing and leather products. The leather industry alone is believed to be worth over 100 million US dollars. Pottery, papad-making, embroidery and soap-making are just a few of the other small-scale industries that give Dharavi a turnover exceeding 600 million US dollars. These thriving businesses (which export to countries around the globe) are often conducted in hovels with sheets of blue tarpaulin acting as walls. Makes one wonder if image consultancy really helps to propel a business forward. Dharavi abounds with friendly locals who are probably accustomed to the interest and curiosity that the rest of the world occasionally regards them with. At the same time, you will not find a feeble old man living in a rat-infested hovel who will spill the beans on his cruel life for you to spin off into the next bestseller. The people there resent being put in a glass case, and expect you to respect their privacy and dignity. It is an interesting place to visit if you want an insight into low-profile, successful living. It is a great place to visit if you’d like to see just how hard people can work. Most of all, if you want to explore a side of Mumbai that you didn’t know existed, schedule a trip to Dharavi today. – As Seen By Richa Gupta. Boarding school, maddeningly fun as it is, doesn’t leave you with as much time to go traipsing around the country as you’d like. For me, the joy in travelling lies in the novelty of the place, the people you get to meet, and the wonderful connection that you feel you have established with a place after you have experienced it. From time to time, I also try to string some words into a sentence about how I felt about the place. I start my exploration – my journey to Amritsar in Punjab, India’s richest state on my quest to find the best foodie hot-spots and capture the versatility of the famous Punjabi meal. Along with me on this trip is Mr. Yashbir Sharma, author of many books on the Dhabas of Amritsar, and more recently the Food Trail of Punjab. He has graciously offered to take me on this induction tour, a rather special one which would take me to some of the most famous Dhabas and eateries of their time. I’ve researched as much as I could before embarking on this trip, from the writings of Khushwant Singh, and Chitra Banerji and the oh so interesting ‘ Foodpath- Cuisine along the Grand Trunk Road from Kabul to Kolkata. In her book ‘Eating India’, Chitra Banerji talks about how authenticity in food has survived in the ever changing young –old immigrant nation that is India. One of the things I’m most excited about is visiting a place which is the cradle of a cuisine that has become a part of the urban eating vocabulary in the West – but sadly in the form of the much eaten and far from authentic chicken tikka masala, Black (Kaali) Dal and naan bread. I realise that the versatility is experiencing the food treks and authentic mixes of our culinary heritage first hand. Whether it is the food or the unstinted Punjabi hospitality, or eating at the langar at the Golden Temple, it is more than just the food, for sure. Once there, I thought the best place to start would be the place that has no divides, a place that exemplifies the ideal of equality amongst the rich and poor. The Golden Temple is not just known for its beautiful construction and spiritual richness. It has been renowned for its ‘spotless langar’ that feeds any and all visitors, Sikh or otherwise, needy or rich, starved or stuffed, with unquestioning largesse…Its immaculate presentation, warmth and inclusive practice of involving civil society members to distribute equal hardy meals, often of roti, daal and a sabzi (vegetable) is an experience like none other. It’s quite a privilege to witness local men and women and the Temple folk putting together the langar that feeds over 100,000 people every weekend. The food was simple, with a sensitive blend of soft spices and textures to compliment everyone’s food palette. 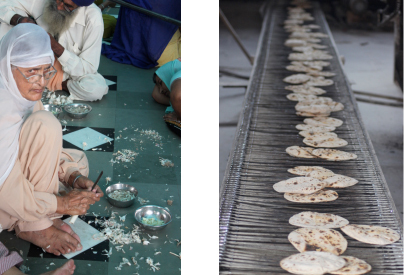 A walk around their kitchens is welcomed and I’m amazed to see, the selfless seva that hundreds of volunteers are doing, and how technology has intervened to simplify the simple task of making rotis. After my clean, modest yet filling experience at the Golden Temple, I began to wander into the galis and local corridors of Amritsar to find the local hot-spots. Doing so, one thing became evident. The pathways to deliciousness were not pretty. For those who desire clean roads, constructed pathways that are meticulously kept and offer easy manoeuvring whether in a car or on foot, this may not be your ideal trek. But let me tell you, it is definitely worth it – at least to your taste buds! The streets and galis are cramped, dirty and display a barbaric array of modern glass and steel structures and stores stuffed next to one another as hundreds of stores are conveniently neighboring one another within five kilometers of walking. Amritsar is famous for such delicious delights as the soft as sponge Aloo Kulchas at Kulchaland, the ubiquitous sarson da saag and makki di roti, paneer purji (bhurji to you and me) and refreshing sweet lassi, the sweetest temptation of all. Once you channel your way to the dhabas that the world talks about, that the top restaurants in India get inspiration from, and what drives thousands of visitors every day, it all makes a bit of sense. We made sure we went to the famous Kesar da Dhaba, which has been around in this exact same location for over ninety years. The owner has a simple menu that hasn’t changed in decades. It doesn’t need to, as people from all over India, Punjab, yet alone Amritsar, flock every single day for his divine Maa di Daal (which is cooked for 12 hours before being served), Sarson ka Saag(in the season only ofcourse), Phirni and sinfully crisp jalebis. Amritsar is known for its fried fish, and the place to go is Makhan da Dhaba. Here, indulgence is served fresh and fried, lightly in gram flour (besan) and egg-white batter topped with carom (ajwain). Typically your option will be sole or singhara – and I’d recommend a local beer to really soak in the experience! If fish is not your fancy, don’t worry. 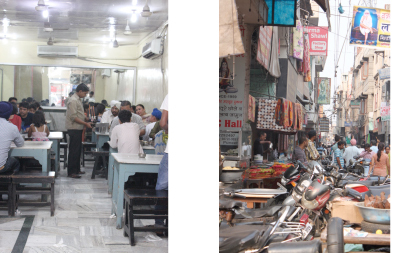 There is yet another institution in Amritsar that specializes in savoury delicacies, Bhrawan Da Dhaba. It’s been around since 1912 and is perhaps the most ‘attractive’ dhaba. For those who rate hygiene high on their places-to-eat at metric, this is the place. Their Baingan ka Bharta and Rajmah are cooked to perfection the food is served quick, no muss, no fuss. The Rajmah is in comparison, if not better, than any five-star hotel and restaurant, with a homey-kick. Yashbirji in deep conversation with Subhash ji of Bhrawan da dhaba. The dhabas are simple. The staff is accommodating. The managers are nice and tend to always be around. The food is sensational and the weather is not so much of a concern – certainly helps if its winter, you can pack in so much more and still have space for Phirni. They feed us with ‘plea yure’ –unstinted Punjabi hospitality to the fore, as long as you don’t ask them to clean up their act! When it comes to travel, anytime is good, but January has its advantages . The heat is not a bother and dust storms are replaced with a cool crisp breeze. In the 12 years I have worked for India’s leading handcrafted textile retailer, I have visited block printing and weaving clusters all over the country. And my passion for the craft sector and the yearning to explore and learn more has only intensified with each visit. I had the opportunity to visit Bagh (in the district of Dhar) in early January this year and the privilege of meeting Sulemanji Khatri there who welcomed me to his dyeing and printing units now run by his three sons Yusuf, Ismail and Mohammed Khatri, and an enterprising and net savvy grandson Bilal who was eager to show me around. Sulemanji Khatri- one of India’s finest craftsmen has been instrumental in creating some of the finest Bagh block prints. The printing technique involves nearly 15 processes of dyeing and washing of cotton fabrics and uses a combination of floral and geometric patterns. Sometimes, for a bedcover with an intricate design, as many as 1300 different impressions are used. Suleimanji Khatri showed me his most prized possessions– two Zajams – magnificent floor coverings where the community leaders would sit and arrive at important decisions. 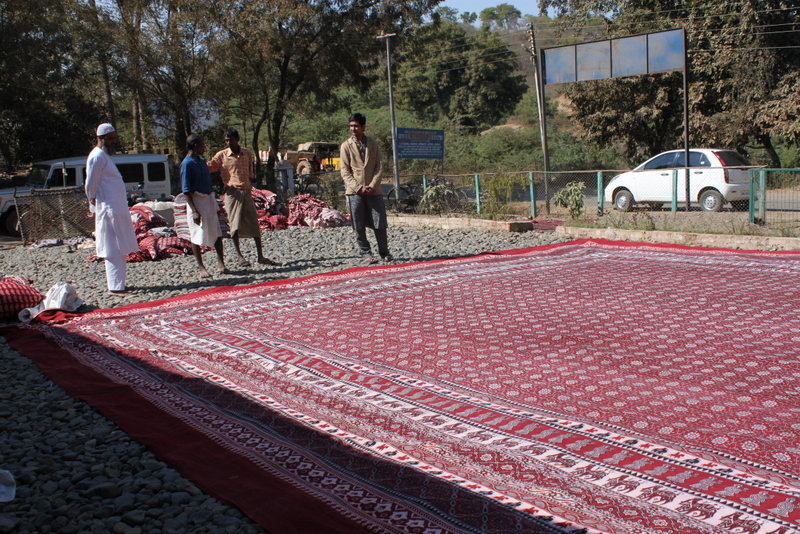 A Zajam is akin to a rug, but thinner than a carpet. It is created using multiple strips of broad pallas, which involve printing of smaller pieces with great amount of precision and imagination. 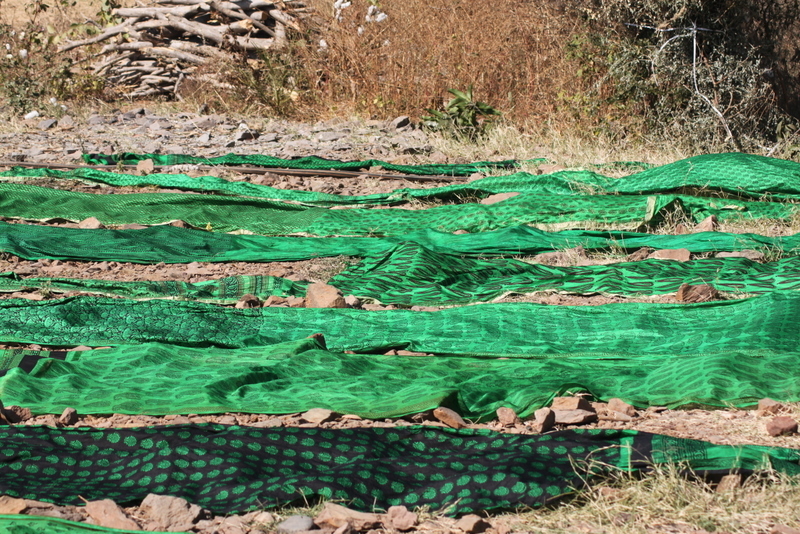 These are then individually dyed and washed and finally sewn together to form the giant rug we see here. It is by far one of the most elaborate pieces of Indian craftsmanship I have ever seen in the traditional colors of the Bagh print – red, white and black. Khatri and his sons Yousuf and Mohammed who carry forward their father’s legacy told me it took weeks to complete dyeing and block printing the Zajams. They used to be made for the royal darbars of yore. Sadly, there are no takers for these today. It would be wonderful if some textile collectors or museums found these noteworthy of making themselves into the private collections of textile afficianados. Another treasured experience of Bagh was watching women block printers at work. In my journeys to block printing clusters in Gujarat and Rajasthan I had never ever seen women printers. It was heartening to see them holding t heir own in a largely male bastion. Interacting with them, I find they are determined to be as good as their male counterparts. It is just a matter of time they will be skilled enough to earn as much as a male printer, Id say. In the midst of all their domestic commitments, to be able to move seamlessly from working in the fields during the season to taking to the printing table at other times it just seemed the most natural transition to make. More power to women! Some of their men were printers themselves, or in the case of one of the women, her husband was a wooden block carver who looked on proudly on as his wife moved with dexterity along the printing table. The discordant and rather sad note in the world of this beautiful craft is that the printer has been forced to use chemical dyes in the traditional Bagh prints. This is to cater to market demand which seems to want hideous oranges and greens, having had enough of the traditional red, white and black. 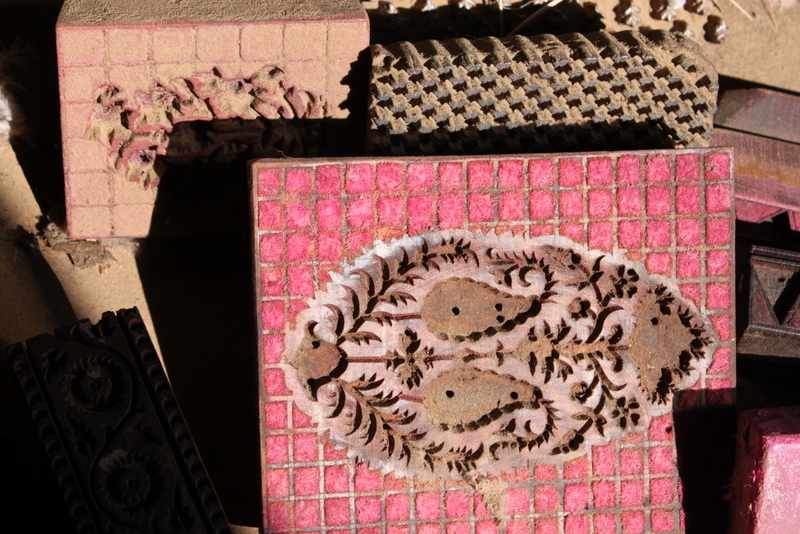 I leave Bagh, but not before Bilaal has showed me the family’s collection of blocks, and not before I have bought myself somethings to remind me of the wonderful time spent, learning, exploring and experiencing this outstanding craft form. Then from the cool, crisp hill stations, they travelled to the sunny south. Golden beaches, salty sea breeze and history awaited them at Mahabalipuram in Tamil Nadu. In the next ten days Carole savoured poetry in stone as she got to study and enjoy exquisite stone sculptures, hundreds of years old. From beaches she visited paddy fields, from the plains she climbed to hill stations. A visit to Puduchery with another Parisian friend proved serendipitous. A taste of French hospitality and ambience at the erstwhile French Colony was memorable as they stayed with a French lady in her Colonial home. Cobbled streets, antique shops, fragrant cafes…Carole and her friend spent sunny days just wandering around and walking in and out of shops with arms full of fine cotton weaves. From a French experience to a Danish one at Tranquebar, where all they had to do was walk on the beach, soak in the sun, enjoy siestas and eat good food. A day trip to a village with lunch on the banks of a temple tank completed the idyll. More temples and ancient architecture at Tanjore and Kumbakonam where they explored remnants of a glorious past. They drove to Karaikudi, the once affluent palace-filled town of the Chettiars and visited the gorgeous Meenakshi Temple at Madurai. They stayed with a Dutch couple at their guest house on the shores of a lake surrounded by hills and forests and even a waterfall. It was a special surprise for Carole that at Kodaikanal she visited an old church that was built by a priest who came from the same town she was born in! It just increased the magic of the hill station for her with its crisp clear and incredible views. The enchantment continued at Munnar with its plush slopes carpeted in tea. She travelled back more than a hundred years as she stayed in a colonial bungalow with its large expansive rooms. There was tea tasting and a taste of life-during-the Raj at the High Range Club. It wasn’t easy to say goodbye as they headed back to the plains, to their next destination – the small village of Champakalam, beyond Allepey, hidden in the backwaters. The home stay was on the edge of a river. Carole soaked in the sounds, smells and the sights of life along the river. A quaint church around the bend, a little temple around the corner, uniformed school kids scampering up and down, ferry boats plying, people fishing and houseboats coasting by. Excellent food, excellent hosts and great scenery later it was time to wend northwards to Kochi, with a stop at a fishing village where it was only them, the waves and the beach. Fort Cochin was another experience altogether with the magnificent Chinese fishing nets, growling ferries, the cacophony of traffic and chatter of people. Carole stayed at an old heritage building converted into a hotel. Her days were spent following her nose around old spice market streets, exploring antiques, sipping ginger-lemon-sodas and shaking off enthusiastic salesmen. She listened to live Indian classical music watched a grand Kathakali performance, ate good food and shopped till she dropped from Ernakulum, just across the bay and a ferry ride away. Carole’s odyssey came to an end on the 42nd day, with melancholy and comradeship keeping us company. This journey had ended, but it only made way for a new one to begin. What next Carole? Pragya’s trip to Sawantwadi and Goa. Raised eyebrows, a quizzical look, and suspicion in the eyes… I am getting used to these reactions that are generated by an innocuous “Yes, I am travelling solo” statement generates. Being in a job that demands its fare share of travel across the country, travelling had become more of a chore for me, something of a necessary evil to earn my bread. Until I had a dream. A dream of being on a Goa beach feasting on sea food. Over the last year, this dream became an obsession which had to be realized. The operative word being “solo travelling”. Thus began the search for someone who could plan and arrange my travel within my means. Every tour package that I came across was tailored for two as if there are no people wanting to travel on their own! One or two travel agencies that I contacted quoted such exorbitant amount that I would have had to sacrifice a year’s salary. “Aap single hai na, isliye zayada cost aayega madam”. My hunt finally took me to Break-away. As the talks between us progressed, there was only one question in my mind “Why did I not think of them before”. They had after all arranged my first break-away. My sole aim was going to Goa when the discussion ensued. But by the end of the final discussion I was a convert for going to a “hidden gem in Maharashtra (about 75 kms away from Goa) called Sawantwadi as well and all in the same cost! Best part being the Breakaway team has NEVER even gently suggested me to travel with someone else to being down the cost. Since for me doing things solo is no big deal and my being born a female an accidental combination of the chromosomes (A happy combination I must say) I have never given much thought tailor made planning for solo women travellers. Whatever a man can do I can do it much better. Alas, in my enthusiasm to travel, I was blinded to the social context that I was rooted in. Safety & security for a single traveller in general & single woman traveller does become a prime concern, especially in a place, she’s not familiar with. This I realized only after I landed for my holiday in Sawantwadi & Goa. But again, I might have forgotten but Breakaway team did not. Right from arranging for the taxi pick up to the properties I stayed in….. customised planning for a solo woman traveller was the essence. The in charge of the taxi company not only provided the taxi but also constantly follow up with me through SMS from the time I boarded the flight to the time I came back to Delhi. If this wasn’t enough (and very refreshing too. After all how many taxi company owners constantly inquire after your well being and needs? ), there were other things that seemingly are minor but go a long way in making a trip a safe and memorable one. For one Breakaway made me stay in a property run by a woman my age who was far too caring about my food needs. I was also my Sawantwadi trip Coordinator, who not only made me see the “hidden gems” and wonderful sights that the rural hinterland of Maharashtra has but very patiently waited for my taxi at the Sawantwadi bus Stand for hours at end ( My flight got unduly delayed from Delhi) without even complaining once. Waiting for me in order to guide the taxi to the properly where I was suppose to stay was beyond his call of duty but he still did it and that too with a smile on his face. Believe me I would not have been able to find the property ever if it was not for him. Breakaway’s mission “Holiday Security for Pragya” did not stop at Sawantwadi which was a rural area but extended to Goa as well. Meticulous planning was done to ensure hotel nearest to the beach & amidst hustle & bustle of city life so that I don’t have to go far for either the beach or food (You see I was a budget traveller who could not afford to take taxis or ride the most popular vehicle on hire, the scooter and the motor-bikes). Sawantwadi & Goa trip was not only a break-away from the rut of home- office- home but a break-away in a true sense of the impression that solo travel for women is risky and fraught with dangers……. Next time someone cautions you against solo travelling, don’t listen to them. Just call Breakaway. ***The above post has been submitted to us by Pragya Mishra, our very first traveller, over email. It has been a roller coaster ride since April, this year, when things started moving very fast on all fronts for breakaway. Suddenly the website identity was frozen and we had a tag line! Website design was an interesting phase. Loads of conversations, discussions, arguments and brain-storming led to what you now see at http://www.break-away.in. We received an over-whelming response for our website. Thank-fully, all good! Turmeric Designs, did the designing part of our website. We worked with Chiranjeev, a very warm person to develop our website. I think he has done a good job! From the day we went official about breakaway, we have sent numerous friends and family to various places. We were not able to help all who came to us, but we tried our level best! We are learning, all of us, growing each day. Every morning, is a new morning, nothing like all the days that have gone by. New challenges and more people who want to travel! Now, that’s got to be right, right? Last few weeks were super-busy, planning, chalking out the itinerary for some friends who are coming down from France. They tour India, along-with us, their journey spanned north-south, hand-in-hand with breakaway. We are looking forward towards a wonderful November – December. Fun-filled, activity-filled and on toes, at all times! There probably will not be time to get back to all of you, but we shall try. There is more that breakaway is doing…..before winter in Gurgaon freezes our minds, we will design a few more breakaways for all of you. As a student of History, I couldn’t have had a sweeter beginning to my autumn break. Himanshu Verma was leading a walk that would take me and my fellow walkers to the lost step wells (baolis) of Delhi. Himanshu is the founder of a New Delhi based arts organization called Red Earth that works with Indian contemporary visual art as well as diverse forms of cultural expression. Apart from being an artist, Himanshu is also a freelance researcher and writer. He is passionate about curating walks and curates some for breakaway to help keep the walkers’ love for heritage going! He is someone who has the ability to take you back in time and inter-mingle with the past. This, I happily realised on that perfect day when he took us on a walk back and forth in time. So here we were on Hailey road, waiting, and surrounded by bungalows and swanky cars. There was nothing remotely ancient about the area. Then Himanshu led us down the path, and was as if we had stepped into another time and dimension. We stood gaping at the Agrasen ki Baoli. Though people believe it was built by Agrasen of the Mahabharata, historians prefer to peg it at 14th century and attribute it to a welfare measure of the Agarwal community. Even dry, the Baoli is awesome. One can with a little imagination picture how beautiful it must have been with the underground spring-fed water lapping at its 150 odd steps. Cool covered pavilions surround the well. It would have provided shade to people on blistering summer afternoons. From the Baoli one catches a glimpse of the sky scrapers of Connaught Place – a perfect juxtaposition of the old and the new. A walk through narrow galis, and laughter and splashing led us to the Nizamuddin Baoli. It was built in 1321, around the same time Tughlaqabad was being built. The story goes that Ghiasuddin Tughlaq refused to let work proceed on any other project while his massive fort was being built. When he found out that workers went about building the baoli at night, he was furious and played spoilt-sport by cutting off oil supply to the area, leaving it in darkness at night. But Khwaja-ji’s divinity came to the rescue when he lit lamps using plain water, providing light to work on the well. Recently, a passage was found connecting the Baoli to the dargah of Nizamuddin. Our next destination was Mehrauli. The drive took us past parts of Lutyens Delhi. Then we went back some more in time. At Mehrauli, once again down a gali, Gandak ki Baoli awaited us. It was so well hidden that we almost missed it. Himanshu told us that Baoli got its name from the sulphur springs that　fed it. The not-so-pleasant- smell of sulphur still lingered. A set of pillars with carvings added to the ambience. A little further down the gali and a left-turn later, we found ourselves at the edge of what looked like a forest. 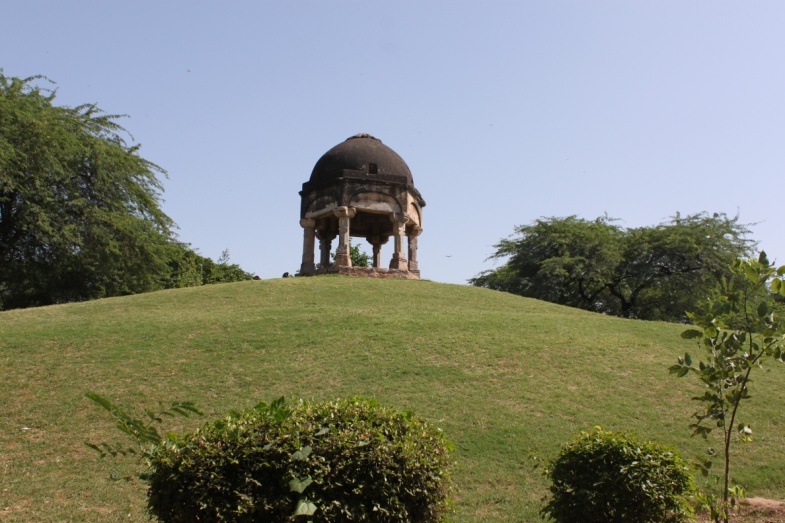 It was the Mehrauli Heritage Park. Amidst the thick green shrubs and bushes, there were remnants of some ancient structures. They stood half-hidden and almost forgotten. 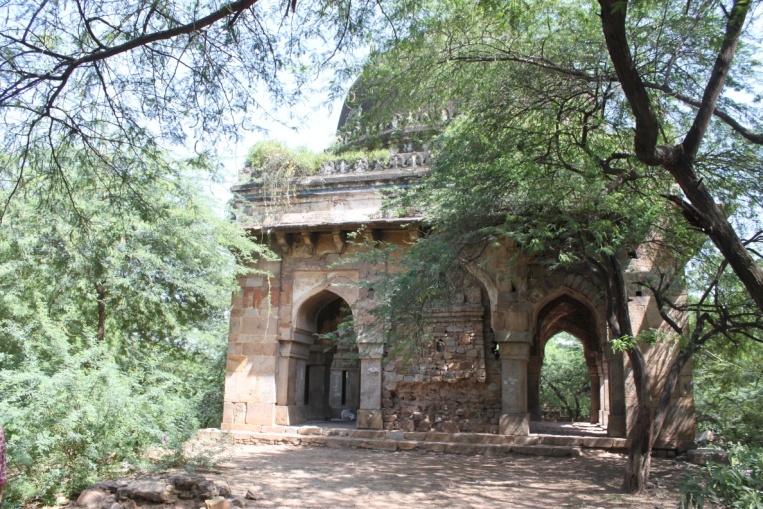 One of the structures was the Rajon ki Baoli. 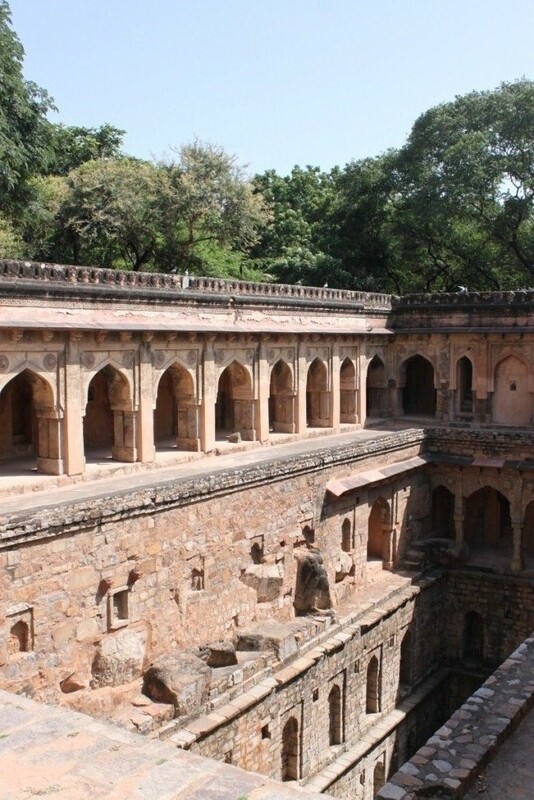 Built during the 16th　century by Sikandar Lodhi, it was the most ornate of the four Baolis we had been to. This Baoli was built by the ruler for the masons (known as Raj). That’s right! 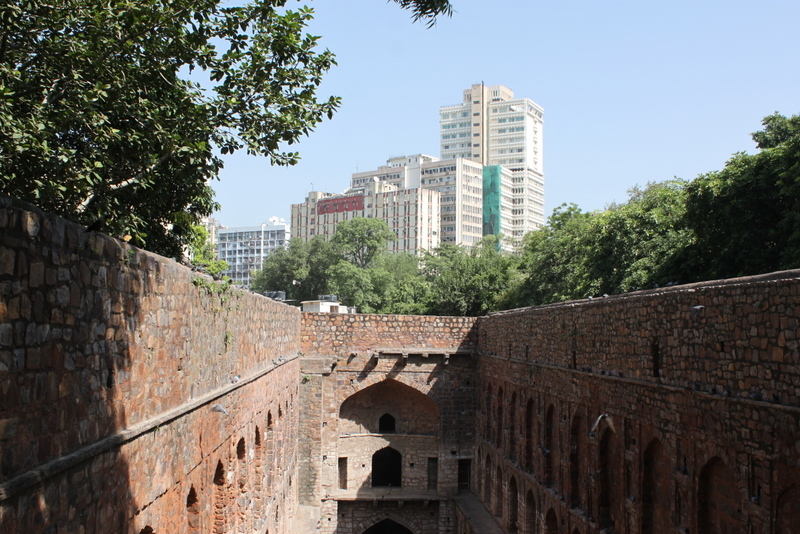 Rajon ki Baoli doesn’t mean the Baoli of the kings! Once we tired of clicking photographs, we just sat there soaking in the beauty of the place. As a student of History, I have always wanted to explore Delhi. I have of course, been to the better known monuments. But this walk was a class apart. We got a glimpse of Delhi’s ancient cities and we could connect with the past. It only made me fall in love even deeper with history. It was a walk like none other I had ever had. It was memorable and I am hoping there will be plenty more from where this came from.